Having been a classroom teacher herself, Christine Porter understands the value to both students and teachers of having the input of a specialist especially at this busy time of numeracy and literacy testing. If she is in your town working with other community artists she is happy to come to your school for a free one hour artist talk. However she can also be booked to come to your school and provide specialist art teaching for your students or teachers that will fit within the current NSW or Qld Creative Arts curriculum. Outcomes, subject matter and/or content can be adjusted to suit the needs of the school or class – all discussed before the visit. 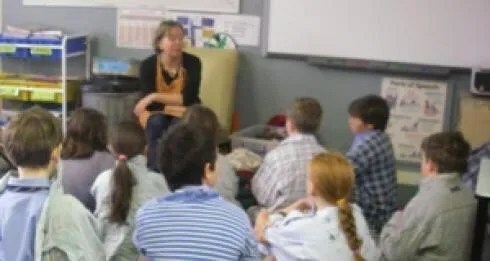 Christine is a registered teacher in Qld and has a current Working with Children Certificate in New South Wales. – the folio as real life artist tool, as well as just something you need to do for THEM. suited to: any school group. The content and speaking style will depend on the age range and purpose. includes: any a.v. or other speaking aids as needed. Christine has developed a two hour lesson (approximately, can be varied) about how to make a painting in watercolour. The students collate the learning experiences into a simple concertina book to take home or for their visual arts folios. cost: this has been taken, in the past, as a module in a whole school day of activities. It will include a tutor fee and may also include a cost for materials. Christine has had huge success working with school students, from year one through to the senior school, drypoint and solar plate etchings. 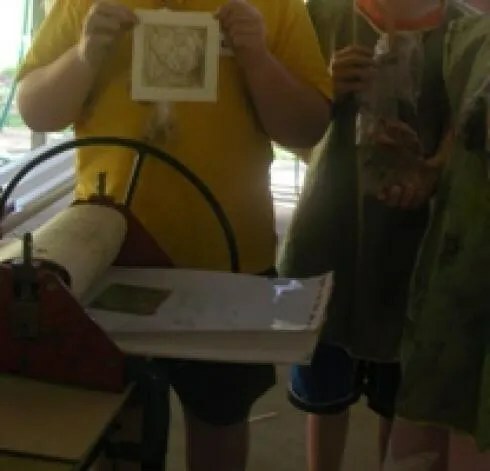 She has created several learning experiences, from single lesson up to several days of activities, that allow the students to learn about and experience printmaking. 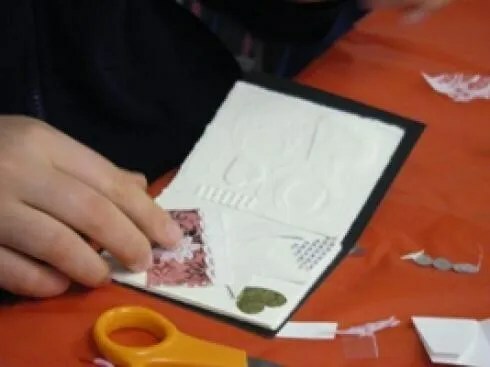 Depending on the length of the workshop and the age of the participants, the students will experiment with drypoint, selective wiping, the idea of multiples, multi-plate colour etching and more. The format of the artist visit is dependent on the needs of the school. suited to: any school group. cost: as well as the tuition fee there will be a materials cost either charged out as a per student fee or actual reimbursement depending on the type and length of the workshop and the age of the participants. For more information see fees and booking. Usually this residency is based around the ARTbird Project (see below) but Christine is happy to create new programs based on your school’s community. Whatever the theme, the whole school gets to spend time together making art which can easily be designed so that printing variations create a permanent school artwork and/or small framable images for participants to take home. 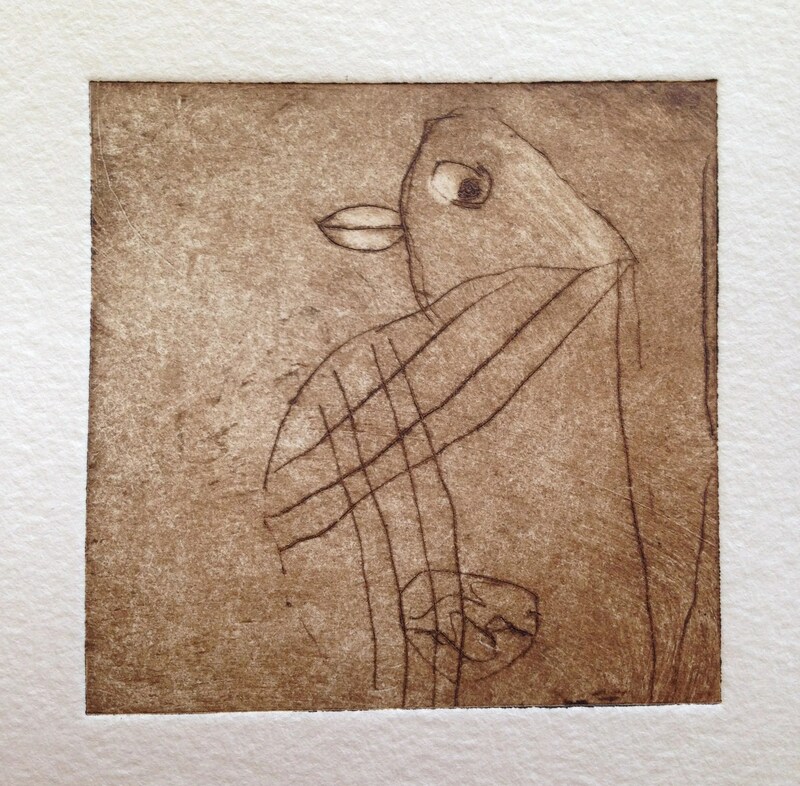 the short-term specialist art teacher: individual groups with their classroom teacher, come to the studio and have a session with the artist making and printing a drypoint with a few colour variation. In this case the studio can be any covered area or activity room. This is a project Christine has developed for small regional primary schools. 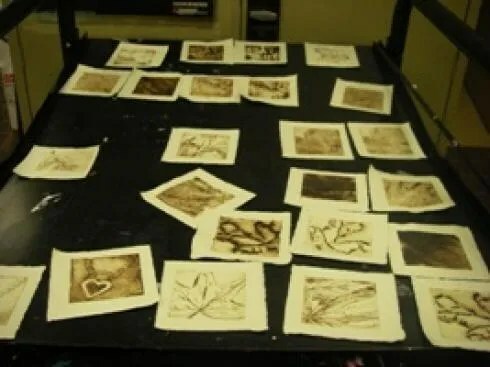 It is a printmaking workshop, where Christine brings her travelling etching press and the children create and explore printing drypoint etchings on found and store-bought plate. The artist visits over several days in one school week. The students research the birds found in their school locality, preparing images in the weeks before the visit, within their science, environmental, and writing programs. When Christine visits the school, her first day is with the adults in the school community (teachers, ancilliary staff, parents). This is a training day at the adults’ level but with information about teaching and encouraging art in the school. Professional Development Certificates can be issued for this day. Ensuing days involve full days with the various class groups within the school, with the help of the now trained adults. An extra day can be organised where, in her own studio, Christine professionally prints a small edition of 5 prints from the plates of each child which come back to the school for exhibition or sale. 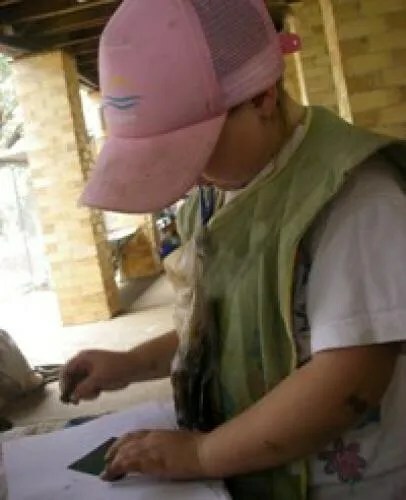 The workshop results in a body of work describing the birds found in the geographical area of the school, with attendant student writing, that may be exhibited, framed or bound as a whole-school work. There is also a long term plan, as more schools take part in this project, for an exhibition of the work at a Regional Gallery. Contact Christine for more informaiton about this very successful and exciting opportunity. This one to three hour professional development training session (certification given) is a hands–on chance for art teachers to experiment with ways of printing drypoint and take it back to their high school or primary school classroom. Techniques include how to make a simple drypoint, how to wipe and print the plate, advanced wiping techniques such as multi-plate printing, masking etc. Classroom management strategies, sourcing materials, curriculum and current best practices regarding OH&S are also included. includes: equipment, materials, demo, notes, training certification, a chance to “play” and usually afternoon tea. It will be held in the art room or utility area etc at your school. cost: will depend on the length of the session and in most cases will include the materials used. Six week modules held during school term time. 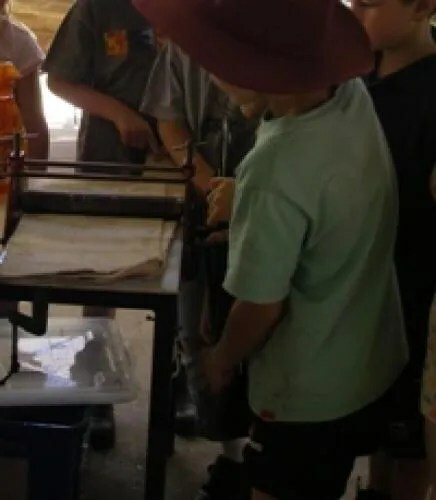 1 – 2 hours, once a week, after school, held at Christine’s printmaking studio in East Lismore. Content will be basic printmaking, basic artist bookmaking, drawing, watercolour painting. The content is driven by the needs and interests of the group but based educationally on the NSW art curriculum. Each week the students finish a take-home project, or work towards a larger project. For students who are studying art at school, it is possible that tie-ins can be made with school-work. After liaison with student/s’ art teacher, it may be that work completed in our class could be included in their school folio. cost: 6 week pay in advance ($100) or weekly rate $20/session . Prices based on a minimum number of students – individual tuition POA.